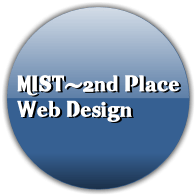 MV: Aselam aliakum, For those of you who have noticed, I have not posted in a while, but InshAllah this will be my return to the site. InshAllah I am coming back by starting an ICNA series. In this series I will write a few posts about my trip to ICNA-MAS convention: what programs I went to, what scholars I listened to, and most importantly what did they say? The Goal of this series is to give you the lessons and the knowledge the scholars taught all of the attendee’s present. Unfortunately this year, The MV(Saad) did not attend the convention this year, so instead I with my family(going for the first time) represented the Muslim Voice. Keep in mind i alone can only attend a handful of lectures so unfortunately I cannot give a synopsis of each program but in future posts InshAllah I will give it for the programs I attended. On Sunday I went to two other sessions, one in the YM conference and the other was just an ICNA-MAS session. I would have liked to go to a role model series because it featured a story of Khalid Ibn Waleed aka “Sayf Allah” the sword of Allah (for those of you who don’t know him read up! ), but since I arrived late on Sunday I had to eat breakfast, since I missed his story I went to another YM conference instead. Who do we have rights upon? who has rights upon us? It began with ICNA’s 2012 Shariah Campaign and Shariah In America where Dr. Zain Bukhari (The President of ICNA) and two other key speakers spoke. Then Imam Siraj Wahaj spoke about the U.S Constitution and our right to freedom of religion and related it back to the ICNA’s shariah campaign. He followed this with some fundraising for ICNA. After that, my personal favorite speaker, Yasir Qadhi gave a speech where I almost cried. He spoke about giving Dawah not only by talking but by action and went on to tell the story of an inspirational women named Dr. Hawa Abdi Dhiblawe (more on that later). Nouman Ali Khan ended the session talking about community. I’ll talk more about this session especially about Yasir Qadhi’s speech in the post that concludes this ICNA series. After the prayers of Maghrib and Isha, I stayed for a little bit more than half of the entertainment session of ICNA. Omar Regen’s Comedic stand up and MCing was hilarious. Followed by talented Singers Asim Khan, Khalil Ismail, and the amazing Zain Bhikha made it great. Sadly I left that night, so I did not attend Monday or the basketball tournament. Sessions and speakers: inspiring, Mashallah, I actually heard that the smaller sessions which tend to be more specific were very interesting. Give Nouman Ail Khan more time, he was always the concluding speaker and his speeches were always cut short for salah. 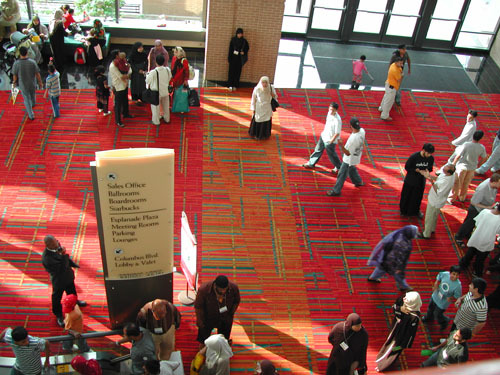 Halal-o-meter: Although some say that there’s a lot of mixing at the ICNA Conventions. I did not see this this year. There was a little mixing during the entertainment session but it was meant for families. Other then that they were pretty strict on separations between the genders and saw nothing fishy. It was organized in a well mannered Islamic environment. Overall Ratting: 10/10- I really mean it! There was nothing I saw wrong in the convention, I think it was a great experience alhumdollilah! Others, including the speakers themselves, have said that this was one of the best conventions, not just ICNA, that they have ever been too! I will give specific information in regards to each session in future posts , that will InshAllah make up the ICNA series. As Salaam Aliakum Dear Brother are you seeking more writers to help with the Muslim Voice? Next Next post: NFL Players @ ICNA, Al-Maghrib and with the Muslim Community!